Every week something new happens at BetVictor and those who pay attention to these new promotions have a lot to gain. In August, the online casino plans on running a string of campaigns that will bring one particular slot machine in the spotlight for seven days. There are plenty of reasons to pay attention to the new titles, because those who play these games will receive 25 free spins. One week has already ended, but for the next seven days, BetVictor should focus on “Lights”, which was recently revealed as the new game of the week. This is a great way to spend a couple of minutes or even hours having fun over the Internet, because the title is already immensely popular with casino members. It was first introduced here and even though it is now possible to play at several other casinos powered by the same software developer, this is where it all began. 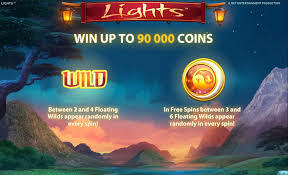 Even if it wasn’t for the 25 free spins, “Lights” would’ve kept players on the edge of their seats, with plenty of wild and scatter symbols to discover. Whenever these signs appear on active pay lines, profits will be boosted while the winning combinations increase. There are a total of 243 ways to win, so even if you don’t win the 25 free spins right away, you will have plenty of fun while boosting your bankroll in the process. The game can be played on most mobile devices and desktop PCs, so there are no restrictions. One of the few prerequisites is for players to deposit at least €50 in order to become eligible for the free spins, which also implies that they need to have a real money account. Those who get lucky we’ll have to wait fewer than 48 hours for the 25 free spins to be credited to their account. The promotional campaign will come to an end next week, but the free spins can be used for the next seven days on any game available in BetVictor casino’s online offer, not only the game of the week. There are almost 50 titles to choose from and the diversity of slot machines will make it easy for players to explore the entire collection without spending a dime. As soon as the current campaign comes to an end, both winners and those who failed to win the free spins can embark on a new promotion.